For using auto focus Minolta cameras with M42 lenses (Praktica, Zenit). 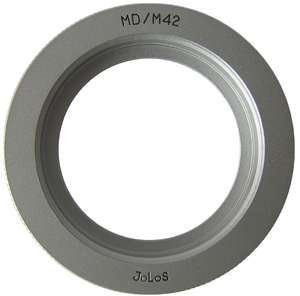 Metric scale M42 keeps its meanings due to compensation of the flange bases difference. Therefore focusing can be to infinity. You should remember that the pusher with the fixed ring doesn’t work, so diaphragm control of the lens is set manually. Bear in mind that aperture pusher is not pushed. It is possible to use Macro rings and other accessories. M (manual) – aperture and flash are changed. Inaccuracy of exposure defining is indicated by expo-correction.